Use paper-less Mistyfuse® for all weights of fabric from velvets and cottons to delicate tulles and organzas. It's a dream to work with, handles well, is incredibly sheer, does not add bulk and bonds firmly once cooled. Since there is no added adhesive, it will never gum up your scissors or quilting needles. 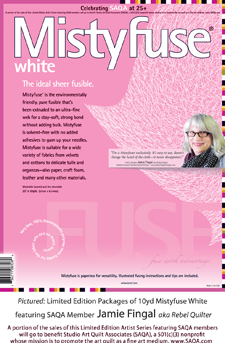 Mistyfuse White is perfect for fusing all colors, weights and types of fabric.